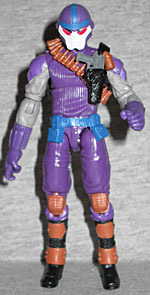 Get ready for that rarest of GI Joe figures: a Cobra character who's not only an individual, but has a real name and a place of birth. Range-Vipers are notorious for being some of the nastiest soldiers in Cobra's army. As Wilderness Troopers, they are at home deep in unfriendly, often unexplored territory, waiting for indeterminate lengths for orders that may never come. They survive with limited supplies by living off the land and eating whatever they can get their hands on. The evasion skills enable them to steal ammunition and provisions from the enemy, often shifting the balance of power before a single round has been fired. As operations commander, Skull Buster sits at the top of their twisted food chain. He grew up neglected and forced to fend for himself in despicable conditions, and he trains his team the same way. He excels at improvising weapons, but prefers despoiling the artifacts of any unfortunate natives and using them as his personal tools. Even his own troops know to give him a wide berth if he hasn't hunted anyone in a long time. The rumor around camp is that he has human bones in his locker - with fresh teeth marks on them. Funny the filecard should mention rumors, because there's a doozy of one about Skull Buster. The character was introduced in Generation 2 - 2002, to be specific. Now think for a moment, toy fans, about what else came out in 2002. 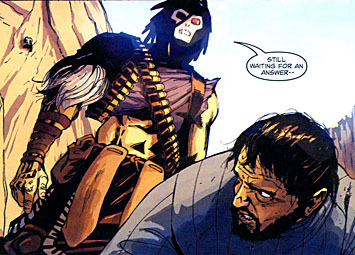 Is there perhaps some property you can think of, that happens to feature a skull-faced villain wearing purple, that happened to have a reboot in 2002? Yeah, that's right: the original Skull Buster was designed to cash in on Skeletor. At least, that's the rumor that's been going around the fandom for years; who knows if it's actually true or not? And while we're on the subject of references, Skull Buster's filecard is full of them. The final paragraph suggests he's a cannibal, and his personal quote mentions he's "feeling hungry for a fight." To go along with that, his place of birth is listed as Donner Pass, and his real name, Albert F. Packer, is a reference to (historical figure) Alferd Packer. 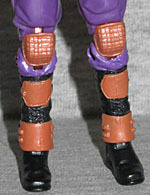 The G2 Skull Buster was just a purple repaint of the 1990 Range-Viper, so naturally, this figure is (mostly) a purple repaint of the "Defense of Cobra Island" Range-Viper. Same masked head, same ribbed sweater, same armored plates on the knees and boots, all that. So for the most part, the body looks good (even with the inexplicable purple colorscheme. And then you get to the arms. 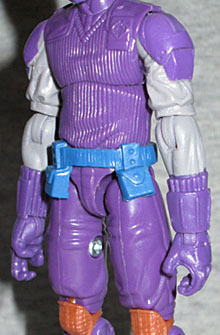 For whatever reason, the Collectors' Club has opted to use the forearms from Pursuit of Cobra Shadow Tracker. As we mentioned in that review, Shadow Tracker definitely seemed to be influenced by DDP's take on Skull Buster, so you'd think that would be fine - but Shadow Tracker is a taller figure than the Range-Viper, so his forearms on this body just look wrong. They're fine if the joints aren't bent - kind of like the awful Infinite Heroes Martian Manhunter, where the elbows were set too high - but with a little bit of motion at all he becomes Mr. Ape-Arms. Not cool. If they were going to go with a Range-Viper repaint, they should have stuck with a Range-Viper repaint; or if they were going to bring in elements of Shadow Tracker, they should have brought in more elements of Shadow Tracker. They could easily have come up with something that split the difference between the old, forgotten toy and the drastic (yet memorable) comic appearance, but instead they aimed for a direct update with a big inexplicable flaw. Not something worth paying premium prices for. 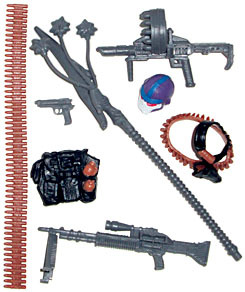 Skull Buster comes with the same accessories as the Range-Viper - a black backpack with gold grenades, a black shoulder holster with a gold bandolier of bullets, a grey pistol, a grey machine gun with bipod, a grey grenade launcher, and a gold ammo belt - plus the spear and flail that Shadow Tracker came with. These are a far cry from the "improvised weapons" the filecard says he likes to use. In Dark Knight Rises, Bane says "no one cared who I was until I put on the mask." Similarly, no one cared about Skull Buster until DDP had him go native in Namibia. Making a toy of that guy, rather than an attempt at a straight update, might have been worth the money the Joe Club is charging for this guy. Then again, in some alternate universe, maybe another you is reading a review about how clumsy the attempt to make the comic character was, and that a plain purple Range-Viper would have been better.